The latest English dubbed episode of Sailor Moon Crystal is now available on Hulu and Neon Alley. 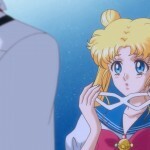 This week, just in time for Christmas, we get Act 7, Mamoru Chiba – Tuxedo Mask. 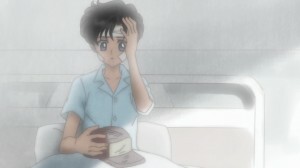 Usagi slept over at Mamoru’s last night so they now know each other’s identity. We get a flashback to Mamoru’s childhood where he wore a hat that looks just like Terry Bogard’s from Fatal Fury. Believe it or not we’re actually halfway through the first story arc at this point. 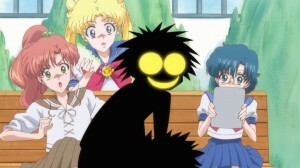 In another 7 episodes we will be saying goodbye to the Dark Kingdom and introducing Chibusa and the Black Moon Clan. Fans who previously viewed the subtitled version when it was originally released will notice a considerable change in this version. One of my favourite parts of this episode was creepy Umino who looks like a Heartless from the Kingdom Hearts games. For whatever reason this scene was updated for the Blu-Ray release to include a less monstrous looking Umino. Since the updated home video versions are used for the English dub these are the visuals we get. Another change we see is that when Sailor Venus shows up at the end of the episode we originally saw her looking like Sailor V from behind but Sailor Venus from the front. 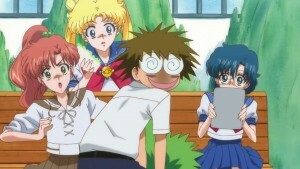 This animation mistake was corrected to include Sailor Venus from all angles. 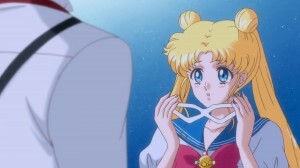 To see changes between the two versions of Sailor Moon Crystal check out Crystal Comparisons. 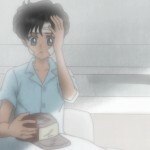 Next week is Act 8, Minako – Sailor V. Make no mistake though. 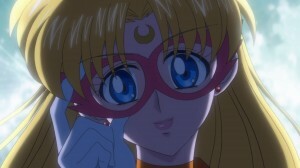 This will feature Minako Aino as Sailor Venus more than as Sailor V.
This entry was posted in Pretty Guardian Sailor Moon Crystal (2014) and tagged Hulu, Sailor Moon Crystal Act 7 - Mamoru Chiba - Tuxedo Mask, Sailor Moon Crystal English Dub, Sailor Moon Crystal Phase 1 - Dark Kingdom, Tuxedo Mask, Umino Gurio by Adam. Bookmark the permalink. Merry Christmas to Sailor Moon. Again, loved the episode, and thought the dub worked so well with it. I wouldn’t have minded seeing Umino as a Heartless or whatever. I actually found that kind of funny, and that makes sense seeing as that whole scene is supposed to be funny. But oh well, what they did in the updates works too. I thought the ‘mistake’ of showing Minako as Sailor V from behind was kind of cool. I wish we had seen her in action as Sailor V for awhile before she switched over to her Venus outfit. Hopefully Crystal will give us a Sailor V prequel season/ova so we can see that happen. Yep I liked the original but I guess it was not actually intentional. This was another episode that benefited from the dub. The dub Vas work so well with Crystal!